With so many good quality kayaks in the market, you need to choose the best one as per your need. That who likes gang fishing this BKC UH-TK219 12 foot tandem sit on top kayak is quite common to them for its some of the unique features. 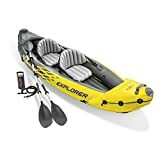 This 12-foot kayak comes with 6-rod holders with two adjustable holders in it that allow you and your friend a complete taste of multi fishing. Along with great stability and comfort, there is no alternative to this fishing kayak. For the beginners to professional or for a family guy, this sit on a top fishing kayak will be a great choice because of its safety level. Sitting on top of the kayak means that there is no risk of getting stuck in the kayak. The waterproof storage and carrying handles facility provides you utmost comfort to protect your accessories and easy transportation. This 12.3-foot BKC UH-TK219 tandem sit on top multi-person kayak perfect for fishing travel and family fun. The three-seat kayak will remain balanced in choppy waters or swift currents. With two adjustable holders and four flush-mounts kayak fishing rod holders allow you and your friends to put several fishing lines in the water at a time. This bkc uh tk-219 kayak has two watertight storage hatches. One is up front and one at the back. This waterproof storage provides safety to your accessories like mobile, wallet, etc. The stern of this uh tk219 family kayak comes with a cargo area through bungee tie-down straps. This allows the user to secure larger gear like helmets or a cooler. Paddle Rest used for secure your paddle while you are not actively moving or in rough water while it need to put. 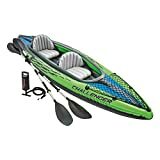 This 12.3 foot tandem kayak comes with four carrying handles. Thus, it becomes an easy job for the 3 or 2 people carrying this kayak over land. The third seat is not as comfortable enough for an adult rider. Hopefully, after reading this review, you now feel like you have better ideas about the options available to you. Kayak can navigate hard to reach areas and can even pass through the places where other ordinary boats may not. 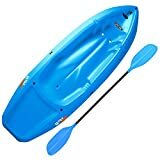 This BKC UH-TK219 12 foot tandem sit on top kayak will serve your need. As we say the third seat is not comfortable enough for an adult rider. We say this because it depends on your gesture; generally, if you three are not above 35 age, then we hope it will not be uncomfortable. However, with all these features, this BKC UH-TK219 12 foot tandem sits on top kayak comes with an affordable price that becomes an attraction to many anglers.